Woodstock is one of America's coolest and hippest small villages and Lalita's Guest House is located right in the heart of it. Woodstock is a mecca for artists and musicians, spiritual seekers, nature lovers, healthy- lifestyle conscious, and those who just like to wake up to the beauty of the Catskills. Lalita's GuestHouse location gives you the experience of a small quaint and funky artist village. 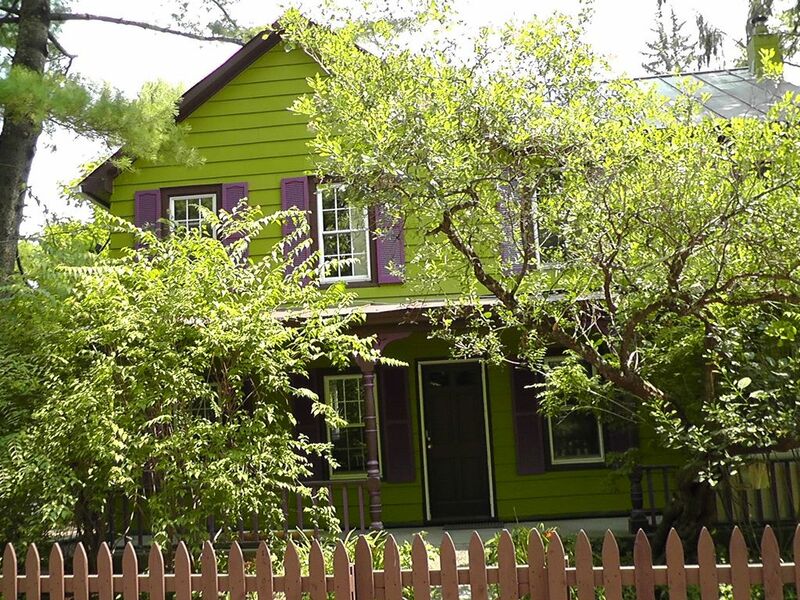 This Victorian house was owned by one of Woodstock's oldest families in the 1900's. The house was called ' The Pine Breeze.' You can take a Trailways bus and walk to Lalita's- thus you don't need a car during your stay. We have coffee shops, restaurants, health food stores, drugstores, wine, cheese, and gourmet food emporiums, galleries, art house movie theatre- all in walking distance. A short 2 minute walk to quaint waterfalls and swim holes. We are located between the Millstream and Tannery Brook. You have two suites to choose from. Newly renovated suites: Lalita's Guest House are two PRIVATE renovated 2-bedroom suites ( photos are labeled to view each private suite) in a turn of the century country Victorian designed to make your stay in Woodstock memorable. Unplug and leave your worries behind. You can walk to all destinations on Tinker Street. Across the street is a sweet waterfall and you can hear the Tannery Brook at night. Around the corner, you have your choice of the best swimming holes in the Village. All modern conveniences are available ( wi-fi, cable, a/c, full kitchen). At night, explore the Village without having to drive. Sitting on the charming front porch allows you to people watch while sipping your morning coffee ( or tea) or your evening glass of wine ( or tea!). Table tennis and room to store your bikes and vacation gear is available. Laundry facilities are on premises in partially finished basement. Perfect getaway: Both suites have been fully furnished with a blend of vintage and modern decor and appliances . Perfect for a romantic get-away. Spacious enough for two couples, a family, and a group of your friends. If you need more space- rent both suites for larger gatherings. Children are welcome and many families stay comfortably. Photos of stairs are included to see if appropriate for you. Firm memory foam queen-sized beds add to your comfortable sleep in bright bedrooms, each having 2-3 windows for cross ventilation and pleasant views of your natural surroundings. Fresh, soft and clean bedding make your stay cozy so you wake up refreshed so you can explore Woodstock and the surrounding abundant natural beauty, art galleries, eclectic boutiques and craft shops. You can walk or take a short drive to some of Woodstock's mot popular restaurants. A little about Lalita: Linda 'Lalita' Winnick is the owner of Shakti Yoga In Woodstock , Saugerties and Kingston. Yoga enthusiast and new students alike love practicing in her country side Woodstock studio. You can make a 'retreat ' out of your stay by practicing lots of yoga ( group or private classes), going on hikes, and eating well ( we have lots of health conscious restaurant- or cook at home!) You can organize a retreat for your friends, co-workers, or host your bachelorette getaway. Lalita will help you book massage therapists so your experience will be as relaxing as possible. I love living in Woodstock and I fell in love with this Victorian that is in one of the best neighborhoods in the Village. You can take a bus to Woodstock and have a fantastic vacation without needing a car. All of the best restaurants and coffee are in a 5 minute walk. I am right on the Tannery Brook and 2 minutes from the Mill Stream. Nice accommodations with good beds very convenient to downtown Woodstock. A great place to use as a home base for exploring great hiking and wandering the various galleries, shops, and restaurants in Woodstock and nearby towns. super cute and close to everything! My fiancee and I wanted a little weekend getaway from Philadelphia with our dogs (italian greyhounds). We wanted to be close to restaurants and hiking! We had a great time in Woodstock. The house was perfect, super cute with an awesome back yard! It was walking distance to town and a couple swim holes. Also a short drive to Overlook Mountain. Our host was great! We cant wait to come back! House was so convenient to the town, creeks and swimming hole...all within short walking distance! Charming Visit to the Catskills! If you're looking to be close to it all, there are few others. It's less than a 10 minute walk to 212 (Mill Hill Road/Tinker Street), swimming holes, and the house was clean! The owner was super responsive and everything was as promised. Thank you so much!!! You were a fantastic guest and I aprreciate your feedback-- good luck with everything!! We were a bit disappointed with this place, yes it’s very old, but is like staying in a student house, which is fine if that’s what you like but we are used to a bit more comfort. The steep creaky steps to access the bedrooms and go to the toilet at night were noisy and hazardous. The basement where washer and dryer are located is like something out of a horror movie. The location however is stunning and a short walk to the Main Street. Not comfortable for a young family with little kids. Thank you for your feedback. We did have a family of three stay there for 6 months and a dog and loved it. We have many families who return after many years. The basement is not a place we recommend our guests to spend time in as it is just for using the washer and dryer. We have a ping pong table, but again, it is an unfinished basement that isn't described as a room we are renting -- We try to represent ourselves clearly as it is described as an old house. I am sorry it was unsuitable for your family .